JD DeCastra, AUP Unit Auburn Class of 2012, reflects on his basic training experience at Coast Guard Training Center Cape May during the fall of 2012. He is currently serving on Coast Guard Cutter Gallatin out of Charleston, S.C. and will report for Officer Candidate School in August. DeCastra's decision to enlist to active duty and attend boot camp following graduation from Auburn is one of many paths that AUP alumni take. The experience of Coast Guard basic training is a difficult topic to put into words due the extent of the experience. The lessons you learn, the people who affect you, and the amount you grow is so extensive that one can only fully understand the boot camp experience by going through it. So, to help put the boot camp experience to words, I am going to focus on the most influential aspect: the mental aspect. The one word that describes basic training is exhausting. Coast Guard basic training is not only physically exhausting, but mentally as well. It is the mental aspect of training that catches people off-guard and is the factor that makes the Coast Guard one of the more difficult basic training regimens in the services. DeCastra, after graduating from TRACEN Cape May, gathers with Unit Auburn shipmates Andrew Husted (left) and Landon Elliot (right.) Mr. Husted currently works for the Auburn Fire Department and Mr. Elliot for the Auburn Police Department. Courtesy photo. The mental aspect of training is incorporated with every task that is given. One example are the 2-1-2 drills. 2-1-2 drills are when we had to hold a book straight out in front of us at eye level while sounding off (yelling) a passage from the book. After a couple minutes your arms would tire and begin to hurt. It was at this point that you would want to put the book down, but right as you began to lower the book your company commander (CC) would start yelling in your face to get the book up. The act of your CC yelling in your face made you fight through the pain and keep the book up. After about 10 minutes of holding up the book you were finally able to rest for a minute or two before starting the process over. Exercises such as these forced you to push your mental limits and reach your true physical limits. It took a great deal of self-discipline to fight through the pain and keep the book up with straight arms for the entire time. A different example of the mental aspect of training was the amount of stress that was placed on the company and individuals. Stress was placed on people in numerous ways, some of which are constant yelling, nearly impossible time objectives, team exercises, constant change, lack of personal time, and the amount of information you had to learn. You were placed under constant high levels of stress from the time you stepped off the bus to the moment you graduated. This constant stress drained everything out of you and made you constantly second-guess your motives for joining. The only way to survive without losing your mind is to be determined, have self-discipline and learn the required knowledge. This is where I had an advantage. The advantage I had going into basic training was being a member of Auxiliary University Programs. AUP did two main things to help prepare me for basic training. The first is that AUP taught me most of the required knowledge before I went to basic training. I knew rates and ranks, I knew how to properly identify and greet people, and I knew basic seamanship. Knowing this information not only helped me to win the seamanship award, but also took a large portion of the stress off because I did not have to devote time to learning as much required knowledge. In addition to reducing the amount of required knowledge, AUP gave me another advantage going into basic training. 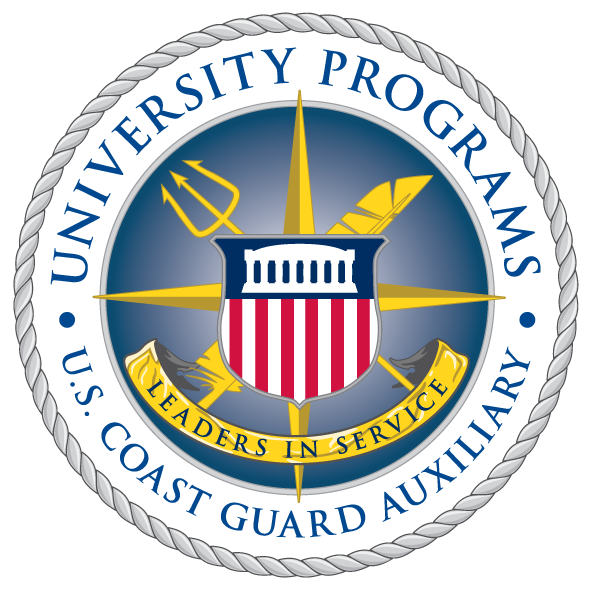 Thanks to the AUP, I had the opportunity to attend several Coast Guard functions and work with different Coast Guard units during my time at Unit Auburn. This showed me what the Coast Guard was really like. During basic training you will be treated like scum, you will be insulted, and you will feel less than human. Being treated like that is done for a reason. Even though it is done for a reason the constant bombardment causes you to underestimate your role in the Coast Guard, and lose drive and focus. A perfect example of this was when the company I was a part of lost drive and stopped performing. In an attempt to motivate the company, our lead CC asked what we thought we would be doing in the fleet, and the answers were cleaning, painting, shining, and cutting grass. It was at this point that our CC explained that as non-rates we will be cleaning but we will also be in the thick of the action: saving lives, boarding vessels, and making a difference. After this was explained to the company, the training made more sense and our drive came back. What this example demonstrates is that when you know your true role as a non-rate you will understand the importance of basic training, be able to maintain your drive, and reduced the stress levels. The bulk of this article has focused on the mental aspect of basic training and some examples of specific experiences, but basic training as a whole presented me with a unique experience. This experience comes from how I grew and how everyone in my company grew. During his time at AUP Unit Auburn, DeCastra teaches young students the importance of always wearing a life jacket. Children’s life jackets are approved for specific weight categories to provide optimal buoyancy and comfort to children of all ages. U.S. Coast Guard photo courtesy Flotilla 8-12, Auburn, Ala.
During the four years before basic training, I was a member of an internationally competitive racing team that designed and built new cars every year and knew how to handle stressful situations. I worked in the oil fields and I knew how to work off of two hours of sleep a night for prolonged periods of time. I completed a mechanical engineering program and knew how to study. I was quite confident that I had learned many of the lessons you are taught in basic training, but was I wrong. I tell you this because it does not matter how much life experience you have, how much you think you know yourself, or how much you think you already know. Basic training will change you and you will learn a great deal. You will come to admire your CCs and they will become some of the most influential people in your life. The greatest lesson I learned, and by no means the only one, was that your personal limits are only in your mind. When you exercise self-discipline and fight through the pain, you will be surprised what you can actually accomplish. A few weeks ago, DeCastra received news that he was offered a slot at Officer Candidate School at the Coast Guard Academy in New London, Conn. He will be reporting in August and will use his experience from AUP Unit Auburn, basic training and service aboard the Gallatin to augment an exciting Coast Guard career.